We use only the finest grade materials that are obtained from reliable sources in the crafting of these Non Woven D Cut Bags. The stringent quality assurance tests conducted by us make sure that only the best quality Non Woven D Cut Bags reach the customers. 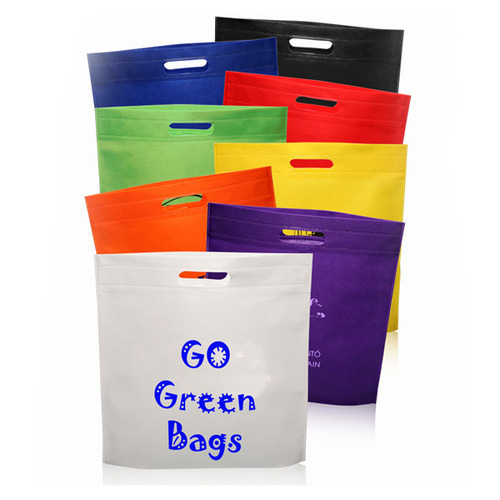 These Non Woven D Cut Bags are made available to the customers at very reasonable prices. We Go Green for a Greener Tomorrow with its vital contribution to eco-friendly world, Go Green Enterprises has emerged as a reputed company for Automatic Bags Making Machines, Multicolor Printing Machines, Fabrics Making Machines, Punching Machines, Lace Sewing Machines, Nonwoven Handle Fixing Machine, Slitting Machines and Molding Machines. With the growing concern for the eco-friendly environment, we offer machines that are manufactured with best quality standards. Also, all the machines offered by us are stringently inspected on different quality parameters to guarantee their incredible execution, strong development, reduced outline, dimensional precision and consumption resistance before being dispatched in the business. With a subjective and substantial product offering, customer driven methodologies, moral business polices, customer driven association, auspicious conveyance of the considerable number of dispatches, we have succeed in picking up the trusts of various number of customers.